Beautiful June weather sent us to our neighborhood splash pad (AGAIN! 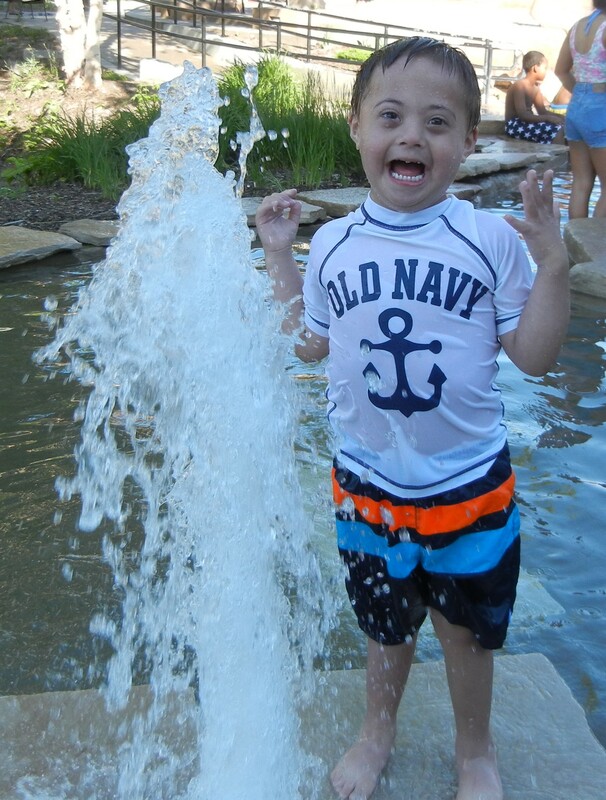 ), and Owen and I were hanging out in the lazy river tossing a pebble back and forth. I was getting him to practice his “uhhhh ppppp,” since he wanted me to throw the pebble high into the sky. The pavement was quite hot that afternoon since the sun was shining brightly. This little girl came walking by, exclaiming, “It feels like my feet are on fire!” I told her I felt the same way…it was very hot. She sat down next to me, asking if we’d ever come here before. I explained that this was one of our favorite places. “What did he just do with his hands?” the little girl asked. I told her that he was using sign language and what he had said. I told her he has Down syndrome. “I’ve never heard of that!” she said. So I asked her if she knew about DNA to which she replied that she learned about it in health class last year. I said that a person’s DNA is made up of lots of things including chromosomes and explained that everyone gets 23 chromosomes from their mom and 23 chromosomes from their dad which equals 46. People with Down syndrome have 1 extra chromosome, so they have 47. She nodded her head. “What does that extra one do?” she asked. A shitload, I thought. But instead I said that sometimes it can cause people to have trouble with their speech or they might need some extra help in school or they might need to see a few more doctors. She thought about that and then said probably one of the greatest things I’ve ever heard a little kid say. And I thought to myself with some tears in my eyes, Yes, sweet girl, he certainly is! Now normally this question of “what does he have?” can set my blood to boil, cause me great annoyance, or turn me into a crying mess. But on this particular occasion, the answer seeker was a little girl about 9 years old and that has never happened to me before. Why didn’t I get upset about her question? What is it about this question that bothers me so much when it’s coming from adults, but I felt compelled to talk it through with this little girl? Stephanie Sumulong is a wife, mother, teacher, and a writer. She has been featured at Down Syndrome Daily, Down Syndrome Blogs, The Mighty, Ellen Stumbo, and the IDSC. Stephanie has been published in a special needs anthology and has edited two books, a children’s book and an E-book, both about life with Down syndrome. You can read more about her family at www.thesumulong3.blogspot.com. October 16, 2014 by Liz Whiteacre	communicating about disability, Down syndrome, Monday Coffee & Other Stories, National Down Syndrome Awareness Month, parenting a child with Down syndrome, parenting kids with special needs, patience, Stephanie Sumulong, talking about diagnosis, talking about disablity with children, water park fun, what does he have?